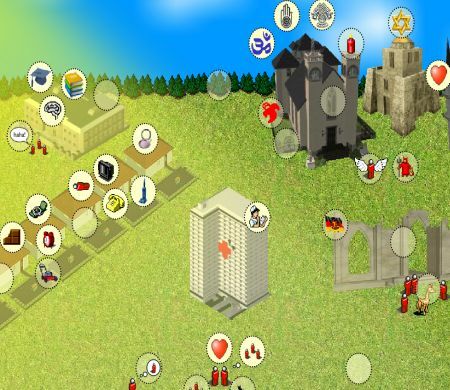 Scroll around the pixel graphics landscape and as you mouseover icons the answer to questions about happiness appear as pop-ups. Do jokes make you happy? 65.3% said "Yes" while 34.7% said "No". The survey questions are fun. As you mouse around you begin to anticipate what the questions will be but the percentages always seem to be surprising. It turns that the the thing the least likely to make you happy is a Stephen King novel. The most likely thing to bring happiness is sleep! I learned all this from the delightful conclusions. If youwant you can take the survey yourself. This Flash application was built by Chris Joseph and David Hume. Create your own Frankenstein monster as easily as clothing a paper doll or building a Mr Potato Head. The end product is kind of creepy to watch as lips move and eyes glance and nose twitches all in a manner that is realistic and unreal at the same time. This Flash web application is by Chris Joseph who is a writer and artist currently in Leicester, England. You can find out more about him at www.chrisjoseph.org. 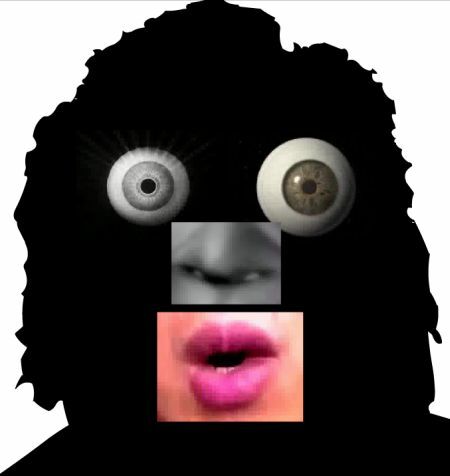 One nice thing is that you can design faces or you can let the computer make up its own designs. Thus the application runs unattended. Sourced from the Rhizome Artbase. glyf: construct is the work of Duncan Holby, a designer /developer working in Richmond Virginia. His personal web site is at glyfdesign.com. The name glyf probably relates to the word "glyph" which is "A displayed or printed image. In typography, a glyph may be a single letter, an accent mark or a ligature." glyf:construct is a gallery with (as of this writing) fifteen individual works. Each work is a Flash file that allows you to control the movement of shapes in 3D by moving the cursor. The first work support very limited motion - horizontal mouse movement only while the later works support X and Y as well as mouse down events. 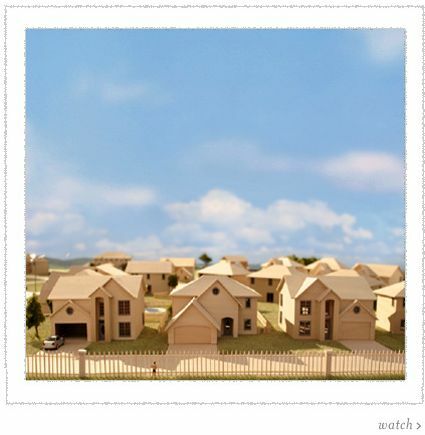 Each of the works is an example of Web Art. Each is a stand-alone work which allows some user interaction to control the display of the site. My favorite work is ge(o)m.v1. I really like the way this highly symmetrical form occasionally appears to be asymetric. Is this due to the eye playing tricks or the actual lag times in generating the lines. Who knows or who cares? The effect is captivating. This site was sourced through the Rhizome ArtBase. 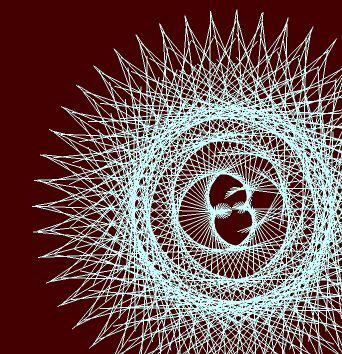 Is there a good place to start in order to get going with Web-Art? Most certainly. 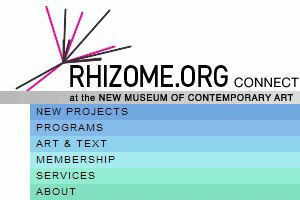 The correct starting point is Rhizome.org - ever since 1996. Rhizome does it all correctly. It commissions web sites as works of art. It writes and about them and proselytizes. It encourages and supports artists and artistic movements. It curates, catalogs and gives prizes. It will even help you set up web hosting for your site. Rhizome is Web-Art. So where's the best place to start in Rhizome? Of course, it's in their collection of Web Art at ArtBase. You will access over 2,000 sites by title artist name, title, keyword and even using a Java time line. Why aren't there more Rhizomes? Forest Grove is a web site built around a Flash video that's built over a short story by John Cheever. Details and story line available at Wikipedia's entry on Maya Churi. The piece one first place at the Seoul Net Fest 2005 - which is where we first noticed the work. The video is quite the largest portion of the project but unlike the videos we normally see, this one makes good use Flash technology and allows for good user interaction. You can select scenes, pause and skip. There is good use of the multimedia effects available with flash in combining text, sound with image movement and transitions. Here is the interesting question: Is Forest Grove a web site that has a lot of movie footage or is Forest Grove a DVD that has a very interactive menu? The good answer is both. Forest Grove was shown at the Sundace Film Festival and it won a price in a web site competition. If we project the current DVD menu interaction into the future and take that DVD data and make it freely available over the Internet for all time and allow people to add their comments then does the work become Web-Art?